I have been trying to add more greens to our meals. Surprisingly, they are usually something Cam will easily eat. He loves spinach and kale, so I figured I would try escarole. He didn’t care for it, but my husband and I loved it, so I decided to share it with you. I don’t know what I ever did before I had a seemingly endless supply of home-grown garlic. This was Transylvanian garlic, I have been very happy with the flavor. 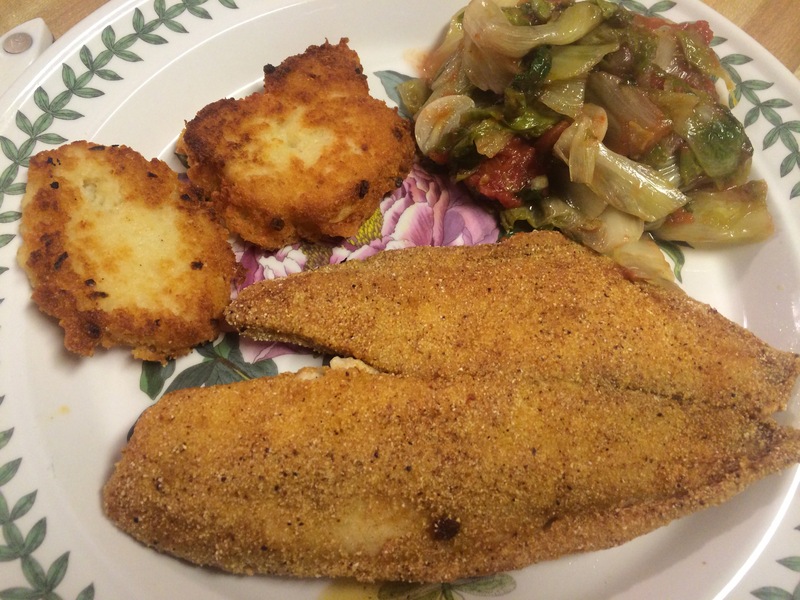 We had this the other night to add some color and another texture to our cornmeal-crusted tilapia. It really was a nice, tasty dinner. Cook the garlic cloves in olive oil in a large pot over medium-high heat until golden. 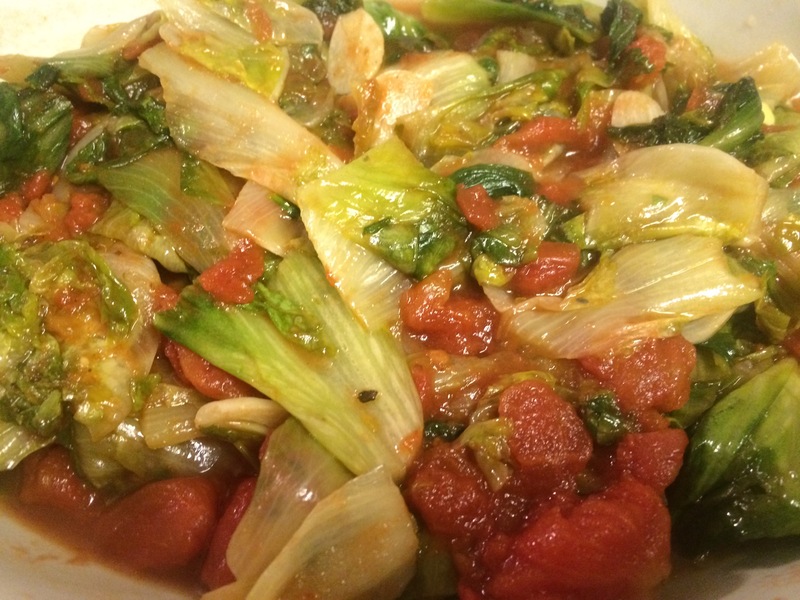 Add chopped escarole in batches, season with salt and red pepper flakes and cook until just wilted, 3 minutes. Add the diced tomatoes and dried oregano and cook until the liquid is reduced, 7 minutes. Season with salt. Drizzle with olive oil and top with grated parmesan if you want. I decided to make three versions of this cookie – plain chocolate chip, pecan and walnut. All three were a hit! 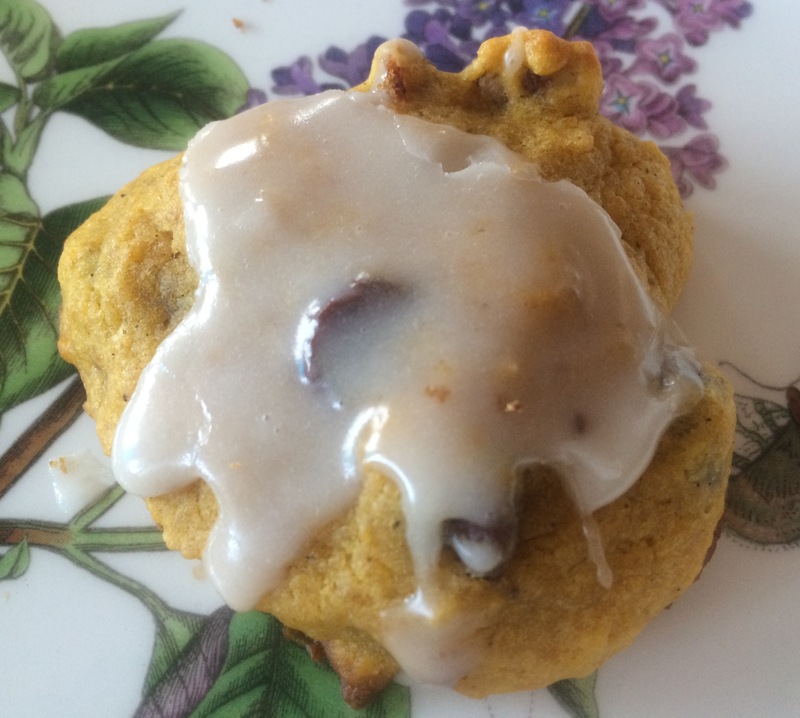 My 5 year old downed the plain chocolate chip, one daughter the pecan, her friend the walnut, and another daughter loved them all. I send care packages back to school with each of them and still had plenty to last us a week at home. COMBINE flour, pumpkin pie spice, baking powder, baking soda and salt in medium bowl. Beat butter and sugar in large mixer bowl until creamy.Beat in pumpkin, eggs and vanilla extract. Gradually beat in flour mixture. Stir in chips and nuts. BAKE for 15 to 20 minutes or until edges are lightly browned. Cool on baking sheets for 2 minutes; remove to wire racks to cool completely. Drizzle or spread with Vanilla Glaze. Enjoy! I have a love affair with dates. My favorites, of course, are the ones I get in the Middle East, but there are some really good dates to be had that are grown in California. I tasted some fantastic dates at the farmers market when I was in Sonoma County this summer. Now there is no need to do anything with these wonderful dates except eat them, I would never use them to cook anything with. But, the ones I can get at my local grocery store are good, but not nearly as good; so they are fair game for cooking. So, in what feels like an homage to my Californian friends and relatives, I added some California red walnuts to the California dates. This is probably my favorite bread I have made so far. Even my daughter who does not like dates loved it. Preheat the oven to 350F and line a 9-by-5-inch loaf pan with parchment paper, leaving an overhang on two sides; coat well with cooking spray. Soak dates in hot apple cider for 20 minutes. Meanwhile, whisk flour, walnuts, baking powder, nutmeg and salt. Brown butter in a saucepan over medium heat, 5 minutes; let cool. 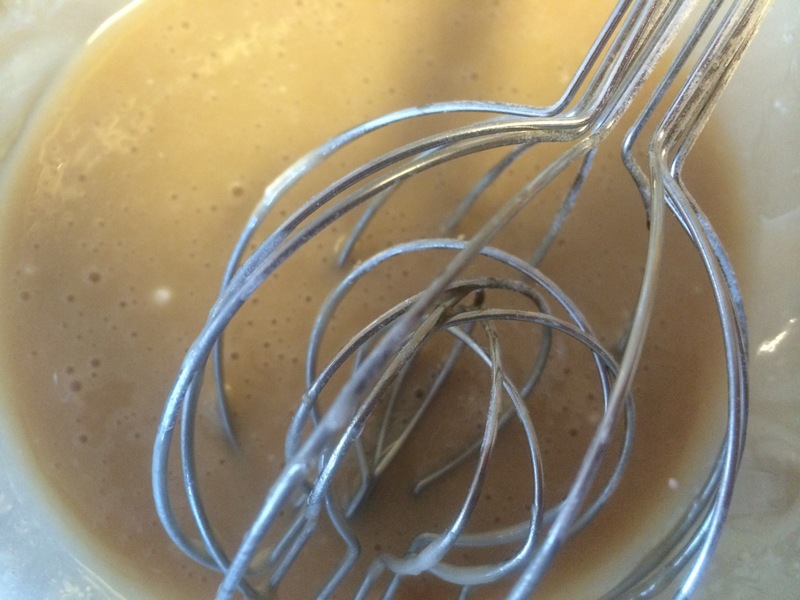 Then whisk with brown sugar, eggs, molasses and vanilla. Add the dates to the wet ingredients. Bake 65 to 75 minutes, until a toothpick inserted into the center of the loaf comes out clean. Let cool 1 hour, then remove the loaf from the pan and transfer to a rack to cool completely. I first had Tah Chin on my first trip to Iran over 10 years ago. We were going on a picnic and this was the delicious dish that was brought along to feed the crowd. So, when I returned to the states, I quickly searched for a recipe to make Tah Chin here. I have adapted one form Farsinet.com. 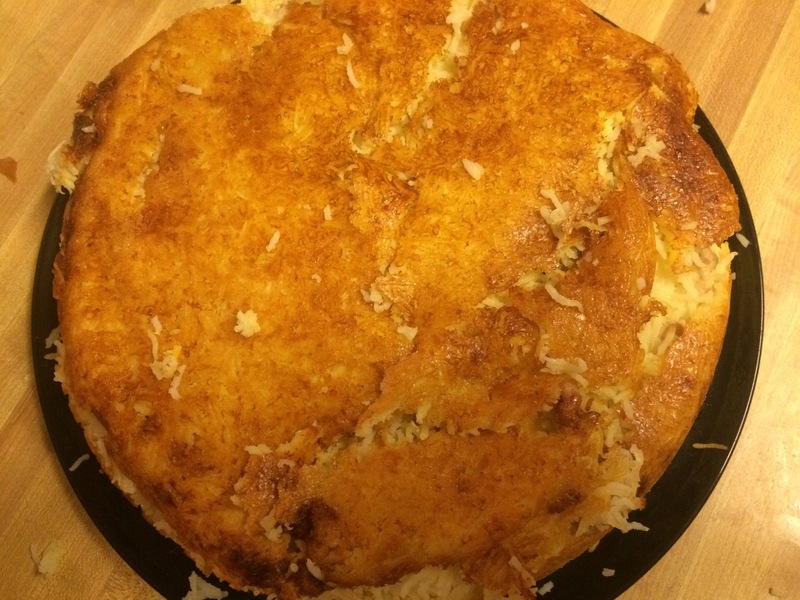 It became a favorite of all my daughters, who renamed it “eggy rice”. It was always a happy mealtime when eggy rice was on the menu. I made this tonight with local chicken and eggs. My oldest is home; and since I had only been referring to what I was making as Tah Chin, she let out a exclamation of delight “Oh, THIS is what you were making!” Even 5 year-old Cam, who claimed he didn’t really like it, devoured a large portion (note – he doesn’t eat things he doesn’t like). Wash the rice and soak in warm water (with added salt) for 2 hours. Drain the water. Fry the onions in oil until slightly golden. Wash and pat dry the chicken and fry in onions until color changes (not necessarily browned). Add some water and bring to boil. Turn heat down and let boil slowly until cooked, adding more water if needed. Remove the bones, if necessary, and shred the chicken. Mix in most of the onions. While chicken is cooking, cook the rice in a pot of salted water until just al dente, it should still be a but too firm to eat. Drain and rinse with cold water to stop the cooking process, drain again. Grind the saffron with a bit of salt, then dissolve in half a cup of hot water. Beat the yogurt until it is smooth. Add saffron, salt, pepper and egg-yolks to the yogurt and mix very well. Pour several spoons of oil and several spoons of the yogurt mix into a non-stick pot. Add a thin layer of rice and flatten using the back of a spoon. Add a layer of chicken on top followed by another layer of rice. Again flatten the rice. Spread several more spoons of the yogurt mix on the rice. Continue the layers until chicken, rice and the yogurt mix have been used up. Add some more water on top. Put the lid on and cook for about 5 minutes over medium heat. Place the pot in an oven, cook for 1 hour. Place an inverted large dish over the pot and turn it over. Tap the pot in order to loosen the contents inside. The contents should fall on the dish in one piece. Cut into wedges to serve. Enjoy! Serves 4 – 6. Quick breads are a big thing in our house, a favorite breakfast food. Zucchini bread is, of course, the favorite, but there is peach bread, pumpkin bread, blackberry bread, and others. 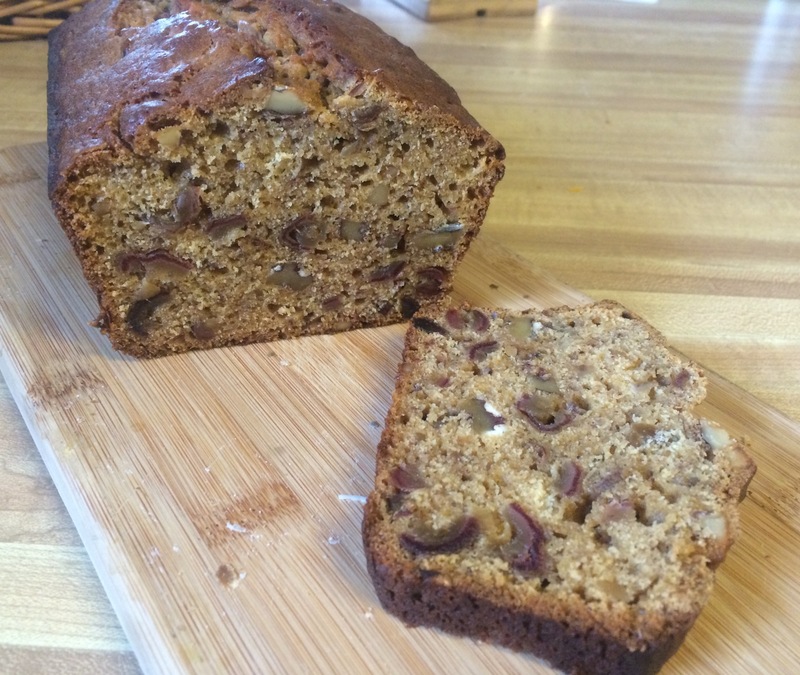 Recently, I added the fig graham bread and sweet potato pecan bread, and will be trying out a bunch of new breads over the upcoming months (til the zucchini crop comes in again next summer). 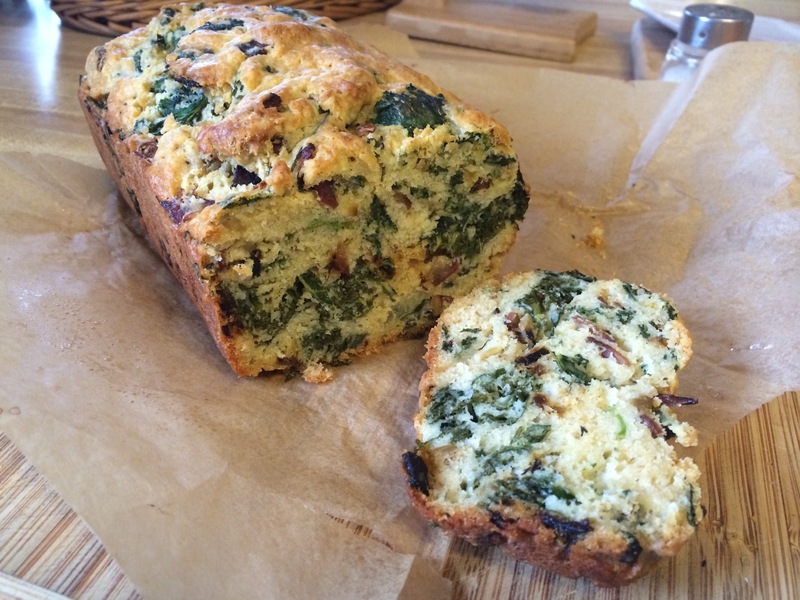 First up, Kale-Turkey Bacon Herb Bread… As a savory quick bread, this makes a very satisfying breakfast bread. 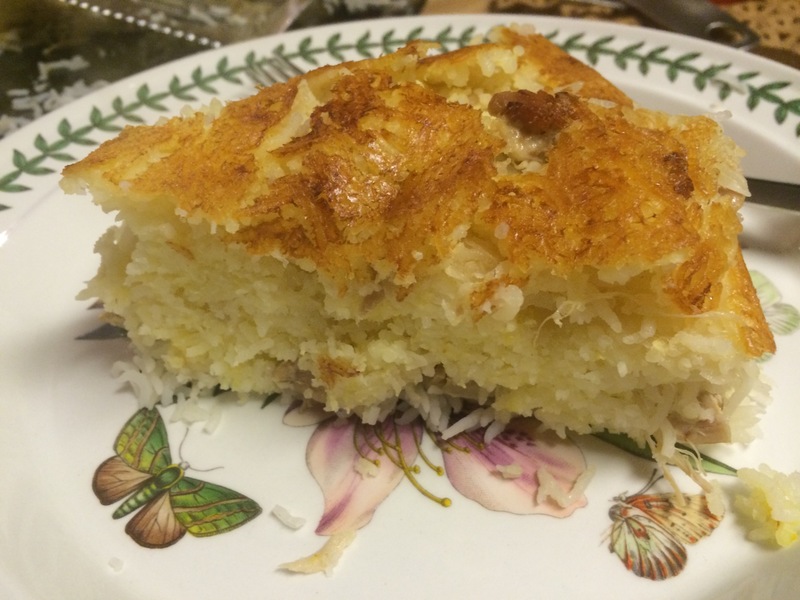 It is especially good with eggs, but is quite satisfying all by itself. 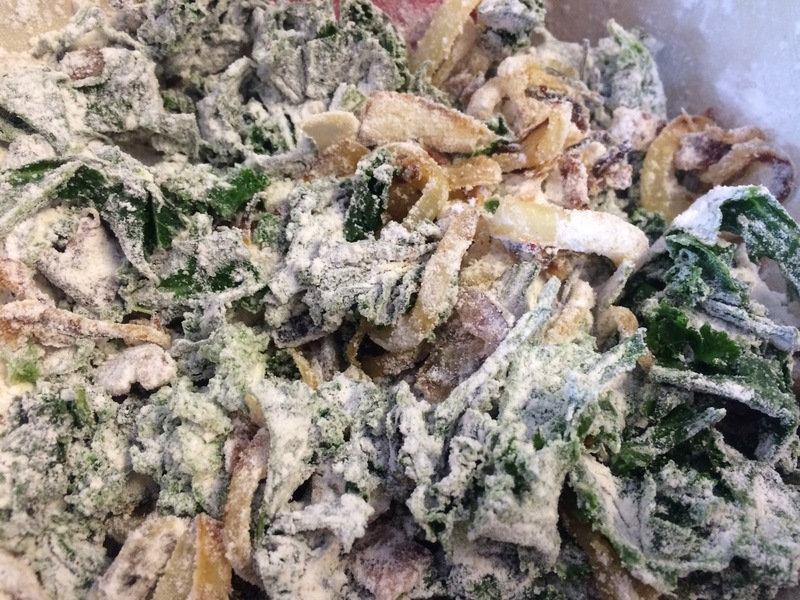 To make sure the kale and bacon stay distributed throughout the bread, add them to the dry ingredients so they get coated with flour. This will keep them from sinking to the bottom of the batter (a good thing to remember when making any bread with heavier ingredients – note – I forgot to do this with the fig graham bread and the figs all sank to the bottom). The house smelled great all day after I made this, no candles necessary :). Line a loaf pan with parchment paper, leaving overhang on the 2 long sides. Coat with cooking spray. In a large skillet, saute the kale in 1 Tbsp olive oil until wilted. Remove from the pan and set aside. Preheat the oven to 350F. In the same skillet, add the remaining olive oil over medium-low heat. Caramelize the onion and bacon, about 30 minutes, stirring occasionally. Meanwhile, whisk together the yogurt, canola oil and eggs. In a separate bowl, whisk together the dry ingredients. Add the kale, onions and bacon to the dry ingredients and stir to coat. Fold the wet ingredients into the dry. Transfer to a loaf pan. Cook for 40-50 minutes until a toothpick comes out clean. Let cool for 1 hour in the pan. then remove to a wire rack and cool completely. Enjoy! 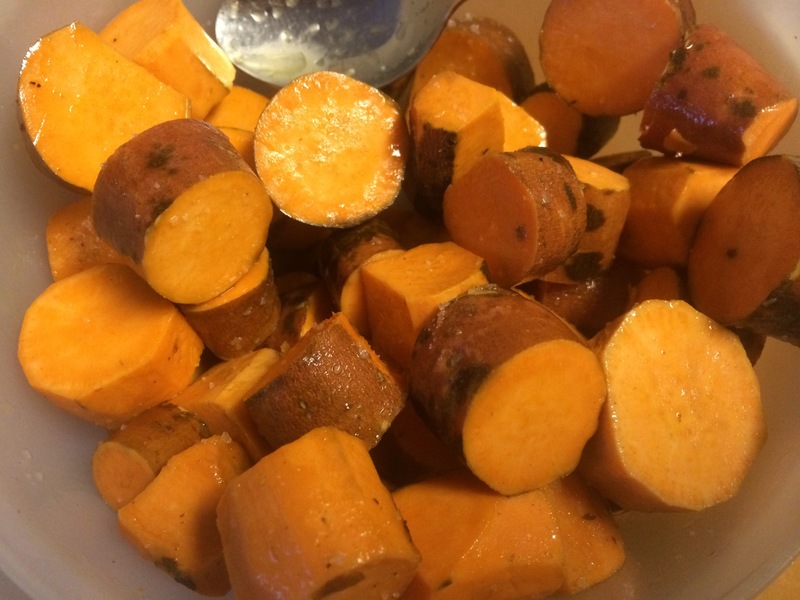 Sweet potatoes from my garden, yes there are still a few… I love anything topped with egg, especially roasted vegetables. Combine that with my new discovery of rice bowls, and you have a beautiful, colorful satisfying base for the egg. 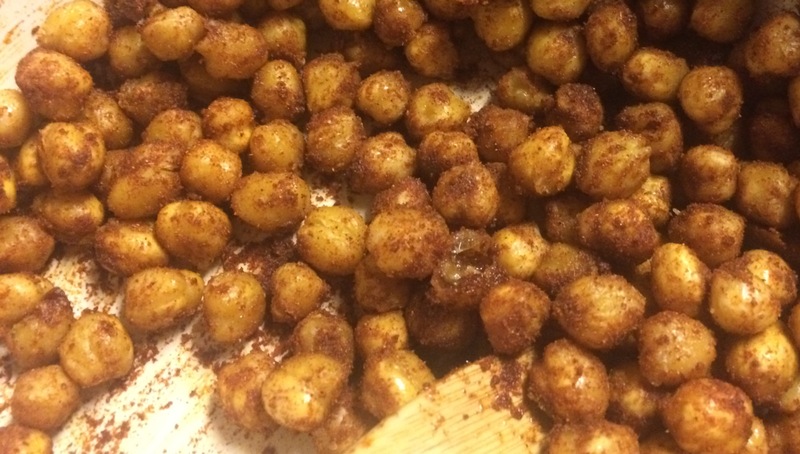 There are also spiced chickpeas to add flavor and texture. The recipe calls for sprinkling them on top, we all liked them better mixed into the base. 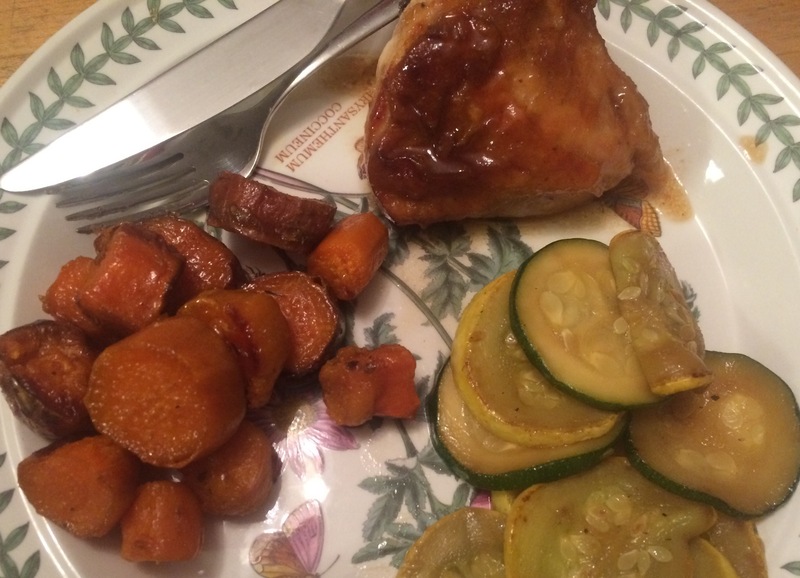 Put it all together, and it was a very happy and healthy dinner. Preheat oven to 400°F. 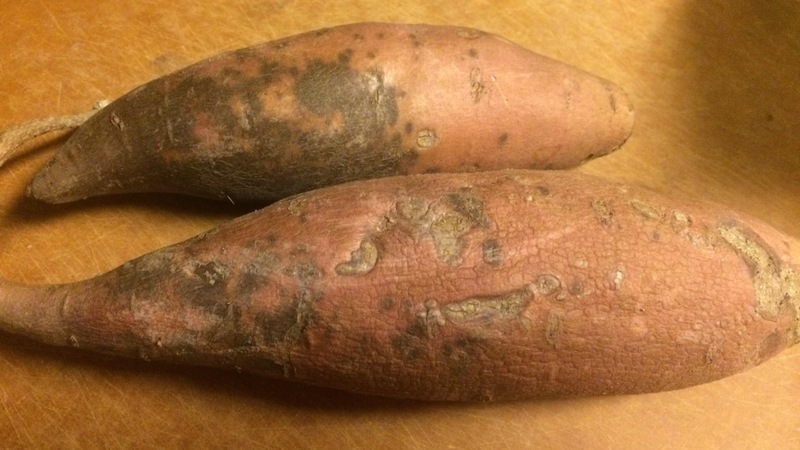 In a medium bowl, toss the Sweet Potato in Olive Oil, Salt and Freshly Ground Pepper. 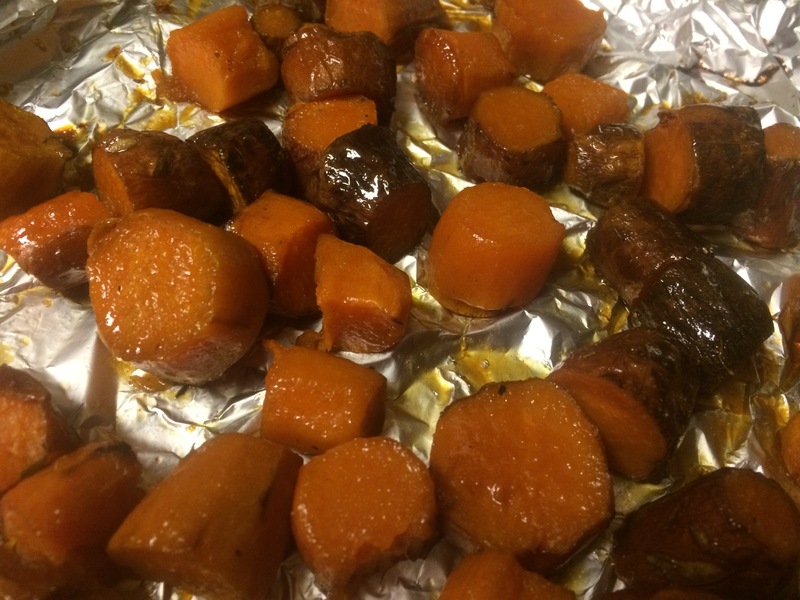 Spread on a rimmed baking sheet and roast until tender, about 20 minutes. Set aside. In a sauté pan, heat 1/2-inch of Olive Oil over medium-high heat. Add the Chickpeas to the Oil, and fry on all sides until golden brown and crispy, about 10 minutes. Meanwhile, combine the Cumin and Smoked Paprika in a large bowl with a pinch of Salt and whisk together to combine. Use a spider or slotted spoon to remove Chickpeas from Oil to the bowl with the spices. Toss to coat and reserve. Heat a medium cast iron skillet over medium-low heat. Add a few tablespoons of Olive Oil, enough to coat the bottom of the pan. Add the whole Garlic Cloves and cook until golden and very fragrant. Using a slotted spoon, remove the cloves and discard. Add the Brown Rice, Oregano, and Crushed Red Pepper Flakes, stirring together, and then raise heat to medium, and allow the Rice to cook undisturbed until it begins to crisp on the bottom. Add the Kale and a pinch of Salt, cooking until the Kale wilts. Scoop the Rice out and divide among the serving bowls. 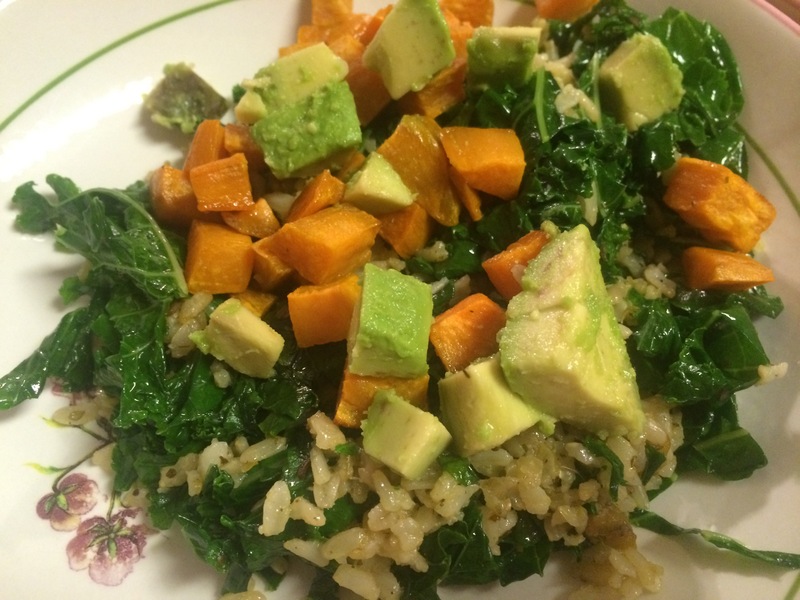 Divide the roasted Sweet Potato and Avocado evenly among the serving bowls. Wipe out the Rice pan, place back over medium heat and add another few tablespoons of Olive Oil. Crack the Eggs into the pan and fry to desired done-ness. Season with Salt and Freshly Ground Pepper. 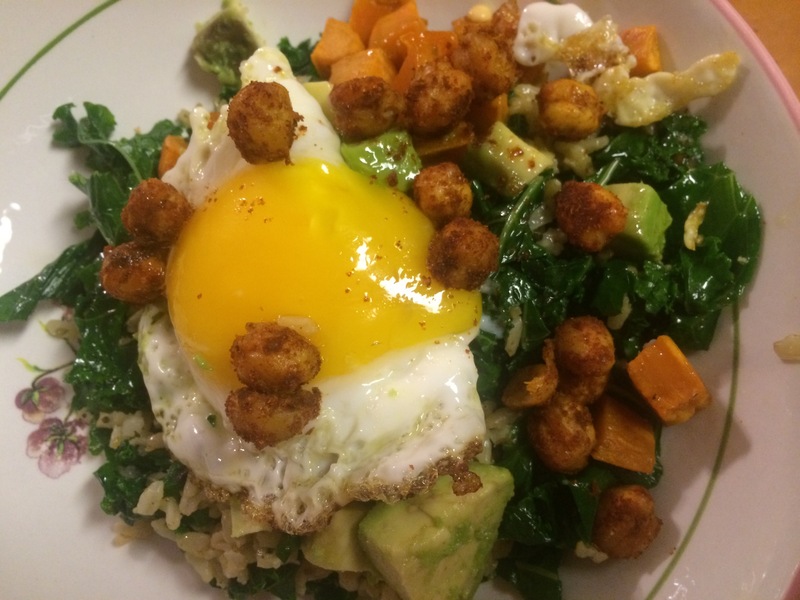 Place an Egg in each bowl, and sprinkle the fried Chickpeas over the Egg and serve with Sriracha. Enjoy! Serves 4.